A couple of months ago Apple Pay was finally enabled for my bank account and credit card, which meant I was finally able to pay for things by either placing my phone on the card reader, or by bashing my watch against it instead. I look forward to a day when I can leave the house with nothing in my pockets – my watch will have a cellular radio and be capable of keeping me in contact with the people that matter, so too will it allow me to unlock my car/house, in addition to letting me pay for things. While the first two in that list might be a few years away (decades at the rate I upgrade cars), my watch can actually make payments today, how cool is that? The reality is somewhat less cool. The problem is the payment limit. Since Apple Pay uses the existing 'Contactless' payment systems, it's also hampered by the same £20 limit. While this limit makes sense with a contactless debit card (there is zero authentication), both the Apple Watch and iPhone are secure; the iPhone asks for your fingerprint, and the watch asks for a PIN when you first put it on, as long as it says in contact with your wrist it is authorised for Apple Pay. This authentication is also a hindrance – why would I fiddle about trying to get my phone to detect my fingerprint (while everyone in the queue is staring at me) or roll three layers of sleeve up to try and get my watch to be recognised when I can whip out my wallet and tap my debit card? The key point is that I still have to have my wallet on me in case the shop in question doesn't support contactless, or the amount comes to over £20. Don't get me wrong, Apple Pay is much better than entering a PIN, it's just not as fast as tapping your card. Google announced a new service recently called 'Google Photos', and I was instantly intrigued. I don't use many Google services apart from search, but keeping memories safe is top of my priorities when it comes to online services. I currently use OneDrive (and before that, Dropbox) to backup photos and was thinking of using Apple's iCloud Photo Library in addition to this. I like the idea of having every photo I've ever taken (in recent memory at least) available from the photo picker in iOS, and on my Mac. However from what I've heard in reviews, doing this slows down iOS devices (I have an iPhone 5, which not being the latest device from Apple means it's inevitably slowed down anyway) and I also want more control over what gets stored on my device. Apple may make nice looking products, but when it comes to storage they are stingy as hell, and my phone is forever warning me that I'm running low on space. I tried iCloud Photos for a few months and found it didn't save space on my phone as promised, I still ended up with the majority of space on my phone used by the photos I'd taken. 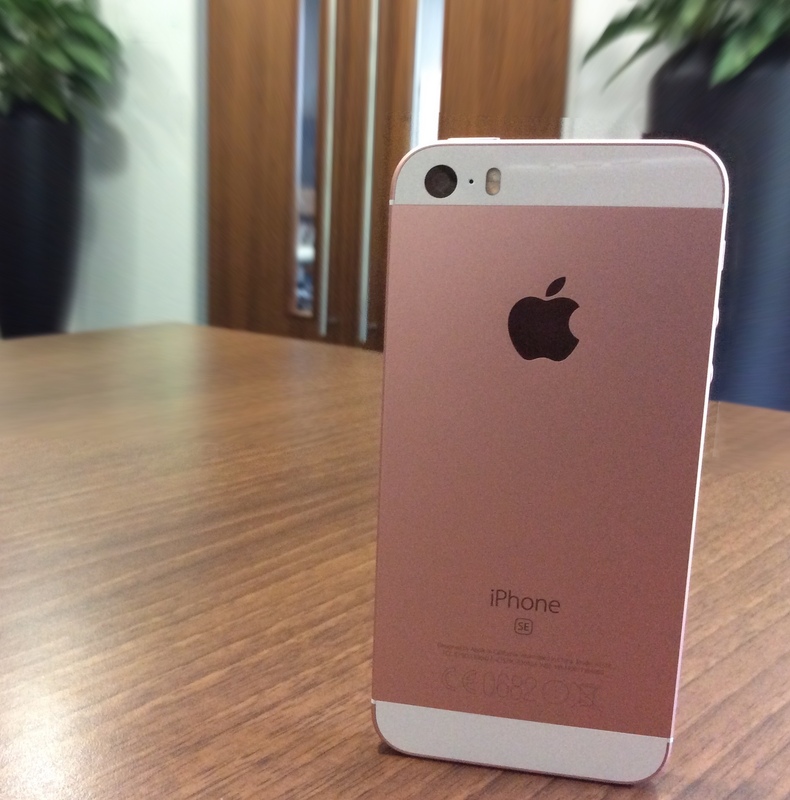 It's also not cheap – you get 5GB 'free' from Apple – no matter how many devices you own. So me, with an iPhone, 2 iPads (home and work), as well as a Mac get the same as someone with just an iPod Touch. Out of this 5GB comes any backups you make (which is the majority in my experience), any emails you receive to your iCloud email account, and of course any photos you upload to iCloud Photos. Buying more space is expensive considering you've already paid a premium for the hardware in the first place. So a combination of being expensive and not that good made me decide to stick with OneDrive (despite the fact it can be buggy, it's at least cross platform and a good price, you get 1TB of space and Microsoft Office for less than £10 a month). 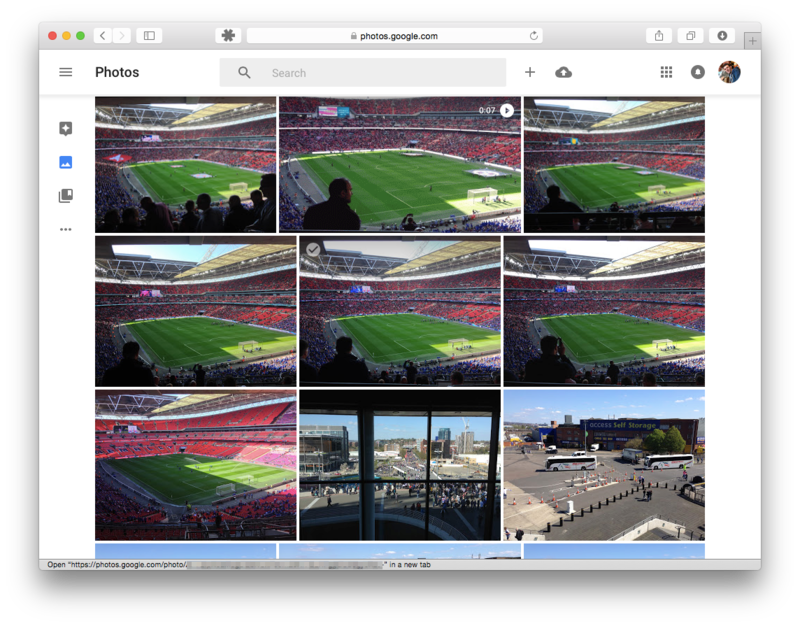 Then Google announced Google Photos…. With any Google product there are two things you need to consider: How long will it last before they shut it down, and what are they doing with my data? I hope this product lasts, and doesn't go the way of Google Buzz, Reader, Notebook, iGoogle or Latitude (and Google+ ?). With Google, you never know. That's a big risk when you're trusting it with your lifelong memories. Luckily it's free (if you are happy for all images to be down-sampled to a maximum of 16 megapixels – my camera is nowhere near that resolution, so I am) so I would urge anyone using it to also use a service like Dropbox or OneDrive who have a better reputation when it comes to shuttering services. What are they doing with the data? I've no doubt the GPS coordinates tagged inside every photo will be extremely useful to Google for targeting me with adverts. It's basically my location history. I'm fine with this really. The app itself is very well written. If you have 3000+ photos to upload like me, then you'll want to download the helper application that will sit in the background and upload instead of using the browser interface. The web interface scrolls very smoothly and makes it easy to go back a decade without trying to load everything in-between. Unlike the OneDrive web interface, it correclty uses the EXIF data in images to pull out the date, rather than the file's timestamp. In OneDrive it looks like I took all my photos in March 2015, because that's when I copied them accross from Dropbox. Google Photos isn't so stupid, thankfully. Like Apple's iCloud Photos, you can make edits from within the Google Photos interface. Apple's approach cleverly stores what you changed in a photo, as opposed to the end result. This means you can adjust the brightness on one your phone, but undo it and add a filter on your laptop without any loss in quality (it doesn't create a losssy JPEG each time). I'm not sure if Google is doing something simular, but it wouldn't supprise me. So all in all, I am impressed – I'm just worried it will be switched off in 4 years when Google get bored of it. Last month Microsoft released Outlook for iPad (based on Acompli, an app it has previously purchased). Since the company I work for uses Exchange 2013, I was able to take advantage of this and try it out. The interface is a breath of fresh air for anyone, like me who is stuck using Outlook 2013’s confusing and dated interface. My favourite feature is the ‘Focused’ inbox with automatically shows you a view of messages deemed important. Newsletters, alerts and other noise are quietly hidden away so you only get to see emails from real people. The ‘other’ inbox is only a swipe away, and the focused view is only that, a view; so it won’t have any effect on your desktop email view. This is surprisingly accurate and didn’t require much training. Replying and managing email is pleasant, with the ability to swipe to archive or flag email quickly. Outside of the corporate word, the app supports Outlook.com, Gmail and other well-known email providers. I like to keep work and personal email separate, so I haven’t tried these. Another surprising feature of Outlook for iPad is the ability to connect to cloud services such as Dropbox and Google Drive 1. A lot of network administrators will loose sleep over this, but ultimately it’s a step forward – especially for users of Office 365 who will be able to access all of their ‘OneDrive for Business’ files and attach them to emails wherever they happen to be. A week point however is the lack of a system extension, so it’s not possible to share a link from Safari to Outlook, or send and document directly from Word for iPad. I’m sure this is on the way, but I do think it should have been included in the initial version. The calendar seems quite basic. It doesn’t seem to do a great job of letting me see other invitees ‘free/busy’ information (the main benefit of using the desktop version of Outlook), but it’s serviceable for a version 1.0 release. It’s quite buggy, for example, I tried to update an appointment start and end date, but it just didn’t work. No crash, no error message, it just didn’t do anything. I’m sure Microsoft’s latest purchase, Sunrise indicates Microsoft is putting some thought into its calendaring strategy, and so major improvements should be on the way. I’m not sure about the unified app approach – I’ve always wished Outlook on the PC were separate applications instead of one big conglomerate (especially since it’s still full of model dialog boxes! I digress…) – separate apps seems especially fitting for iOS, and I can only think it’s a branding decision to go with one big ‘Outlook’ app on iOS. The first release had no security requirements at all, so if your system administrator had mandated users have a passcode on their device, Outlook would ignore it. This has been resolved, though unfortunately it requires you set a PIN at a system level on the device, rather than just for the app (as had been the case with the pervious OWA app). I liked the fact I could have more lax security on my personal device (e.g. ‘Ask me for a PIN after 1 hour’) while the app could be much more strict (‘ask me for a pin after 5 minutes’) – this worked in the old OWA app, but not anymore; which is a major disappointment. Some system administrators might lament the fact the then app will store your emails on Amazon’s AWS servers (soon to be Azure, I have to believe), but it does allow the app to do lots of cloud processing that ultimately benefits users. The fact that Microsoft just released the app without any warning and a way to block the app is probably the bigger concern in my views, as I can understand organisations who have various security practises (ISO et al) not being very happy about being caught off-guard like this. Overall, Outlook for iPad solidifies the iPad as a tool for business and makes me think that one day, many users will be able to use an iPad (or similar device) exclusively at work. It’s missing some key features at the moment (you can’t set your ‘Out of Office’), but I’m certain they will come in time. The bigger question is whether tablet-devices will ever replace traditional PCs in the workplace. This is probably the subject of a future blog post, but with Outlook, Office and the cloud it’s becoming an increasing possibility. I personally use Outlook for iPad as more of a sidekick device than a laptop replacement, but then my job does involve using a lot of traditional desktop software such as Visual Studio, or macro-enabled spreadsheets. That said, for many enterprise users, an iPad with a decent hardware keyboard is now a viable alternative, if not for the small screen size. 1. Great to see Microsoft embracing interoperability, in contrast to Google, who refuse to support Windows Phone. As anyone who owns a MacBook air will know, these amazing laptops fall down in one key area – storage capacity. Of course you’re free to plug in an external hard drive to get extra space, which with USB 3 will be super snappy. External hard drives are a bit clucky however, especially when you want a laptop to be portable and easy to use say, on you lap. Luckily, the 13 inch MacBook Air models have an SD card slot, so it is possible to add in an SD card and gain additional storage that’s easily portable. The problem with most SD cards is they extrude from the side of the laptop – meaning anyone who leaves a card in all the time is likely to damage or loose it. When I tried to move my 20GB iPhoto library on to the drive, iPhoto crawled to a halt and was unusable. I’m pretty tech savvy and so I of course took this on as a challenge and spent quite a lot of time trying to solve this; by rebuilding photo thumbnails, repairing permissions, making sure the drive was formatted HFS+, and even rebuilding my library from scratch. In the end I came to the conclusion that the microSD card supplied was simply not up to the job. One of the best features of the MacBook Air is the ability to leave it in sleep mode for days on end without the battery draining much. I noticed after I’d started using the MiniDrive that my battery seemed to go down a lot while it was in sleep mode. After some digging, I discovered that Mac OS X will put the laptop into a “deep sleep” mode (similar to Hibernate on Windows) after a few hours in normal sleep to save on battery life. The problem I found is that Mac OS X will never do this if an SD card is inserted. That means standby time is significantly reduced when the Nifty MiniDrive left in, and the while point of the Nifty MiniDrive is that you leave it in. I must stress this is not the fault of the Nifty MiniDrive (any SD card will cause this to occur) but I was surprised to see it wasn’t mentioned on their FAQ page, as it could be a problem for some people. I found it was quick enough to store my iTunes library on, and Steam had no trouble storing and loading games on it. Team Fortress 2 ran absolutely fine from the Nifty MiniDrive. For anyone with a MacBook bursting at the seams with games and music, the MiniDrive is probably worth getting. You could also theoretically move your Dropbox or OneDrive folders onto the drive. Another often quoted use of the Nifty MiniDrive is as a Time Machine backup drive. This can work well in theory if you want to make use of Time Machine’s versioning features, but as a total backup solution, having your backup inside your laptop at all times means if your laptop gets lost or stolen then so does your backup, so for me this was a non-starter. So would I recommend the Nifty Minidrive? My answer is yes if you’re aware of it’s limitations. For people who routinely shutdown their Macs instead of using sleep, they shouldn’t notice any big changes in battery life. If you need to store large, rarely used files then you shouldn’t notice the performance issues either. Hopefully the next version of OS X will iron out the battery life issues, and faster microSD cards will be released in the future, making it a good investment. 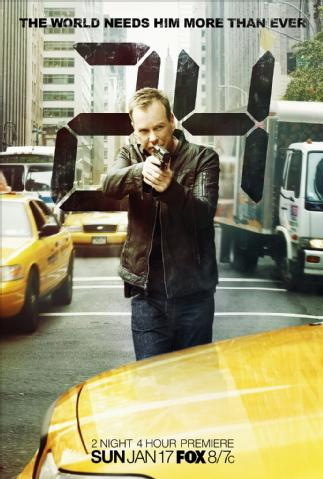 I've been a long time fan of the TV show '24' and back in April I finally got round to watching the final season, season 8 as it became available on Netflix. I've got the rest of the series on DVD but had been waiting for the price on iTunes to drop below £20 – so I was very thankful when all 8 seasons appeared on Netflix. This time we get a day in New York City. It starts with Jack Bauer sitting at home with his Granddaughter. Quickly events unfold that require Jack to return to action. The first 10 – 16 hours of this show were good TV, very good. However the final 8 episodes were AMAZING TV, adrenaline filled suspense with just enough intelligence to pass itself off. After I watched Homeland I feared I'd find 24 outdated, and in some respects it did – the over-the-top set design of CTU, the inevitable mole, the fact that dramatic events only ever seem to happen at 55 minutes past the hour – however I was very impressed with this season, and I'm so glad that 24 is to return for a 9th season, albeit for only 12 episodes. The last 5 minutes were almost tear-jerking. So if you have Netflix, block out a week in your schedule and catchup on this brilliant show. My first impression is that the lighted screen is beautiful to read from, and will make it easy to read in pitch-darkness. That’s the real benefit here, whether in bed at night or outside in the sun the screen just looks great. You may read reviews complaining about some unevenness in the lighting along the bottom of the screen, yes I noticed that but it’s really not an issue at all, since that part of the screen only shows your progress information anyway, not text from the book. Unfortunately the touch screen is a major step backwards in page turning, instead of 2 large buttons on each side of the device for backwards and forwards, there’s an invisible grid on the screen tap over to the far left to go back, tap in the middle to right to go forwards, and at the top to bring up the menu. It feels clumsy and makes this device stop short of being the perfect reading device. The touch screen does make the virtual keyboard easy to use, so buying books is much easier. However I spend about 0.0001% of my time on the Kindle inputting text so I’d be happy do to without that. I often find myself getting lost in a book because I mistakenly went forwards instead of back. Currently on season 3 of this and really enjoying it. Very much a dark comedy most of the time. Great to see more successful shows from X-Files alumni. Did you read that right? Yes I posted to this blog in 2010 when I replaced my old iPhone 3GS with HTC’s Desire S. and 2 years before that when I replaced my Nokia N95 with the iPhone. At the time of getting my Android phone I wasn’t too happy about the state of the iOS ecosystem. Apple was banning apps left right and enter, and the iPhone 4 didn’t excite me much. I took the plunge and switched to Android, and was immediately pleased with what I got. Over time however I came to regret that decision. What I took for granted in iOS was missing from Android – quality. Quality is a difficult concept to describe. We all know it when we see it, but it isn’t always obvious to see when you’re looking for it. In the case of my HTC Desire S, quality means the small details in the user interface that you would never notice until you have to do without – take for example making a phone call to someone who isn’t available, I’d go to my recent contacts list (3rd in the list), tap their name, and wait while it rings. After 20 seconds it would hit voicemail. This was an urgent call, so I wanted to call back straight away. I hit ‘Hangup’ and went back to the recent call list, thinking to tap the name – still 3rd in the list. Just as I tap it however, it moved from 3rd in the list to 1st, and I end up calling someone else instead. The phone was just slow. It may have been dual-core compared to my single-core iPhone 3GS, but that comparison is like sitting a motorbike and a lorry next to each other with the same engine, and expecting them to hit 60 at the same time. Then there was the lack of updates – it took a year for me to get Android 4.0 and when I finally did it was through a HTC developers site (and made the phone even slower). The on-board software was buggy and confusing. There seemed to be 2 of everything. A HTC Twitter app, the official Twitter app. A HTC mail client, and GMail, HTC Facebook and well, you get it. On the other hand with iOS you get minimalistic software that actually does useful stuff. It wasn’t all bad of course, as by original blog post stated. You do get a lot more freedom, but I found myself not caring since Apple seems to be far more reasonable these days when it comes to App Store Approval (and I actually quite like the fact that Apps can’t take over system functions so easily).